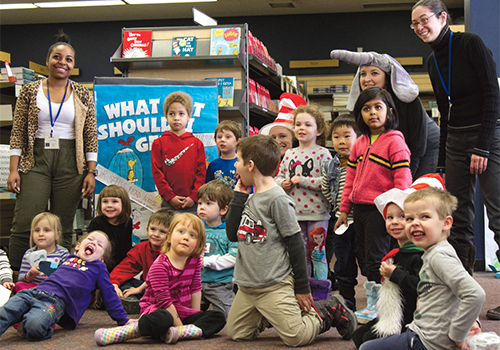 Theodor Seuss Geisel, better known as Dr. Seuss, would have celebrated his 112th birthday this year, and to mark the occasion, the Kent State Bookstore hosted its second Dr. Seuss ‘Read Across America’ celebration. With his particular genius for infusing the spirit of his times and capturing the timeless innocence of children, Seuss’s appeal has spanned the generations since he published his first book, If I Ran the Zoo in 1950. Seuss would go on to sell over 600 million copies of his books, which have been translated into more than 20 languages. 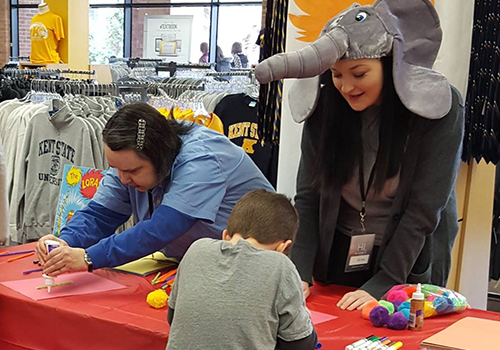 In collaboration with Kent State University, the campus bookstore hosted a Read Across America event that celebrated children’s literacy and the birthday of Dr. Seuss. Children from Kent State’s Childhood Development Center, ranging in age from two to five years of age, attended the event, along with students currently attending the University. “The university bookstore will continue to put students first, big and little,” noted Cesquinn Curtis, Kent State’s executive director of administration in the Division of Student Affairs. The event brought Seuss to life as several Kent State Bookstore employees dressed as characters from the beloved author’s popular books. Robin Spand read the classic favorite Green Eggs and Ham, while Ellen McDougle and Olivia Hanks portrayed the Cat from Cat in the Hat, and Horton from Horton Hears a Who!. The celebration also included games such as Cat in the Hat Says, Green Eggs and Ham Matching Game, Pin the Hat on the Cat, and Stack Yertle the Turtle. 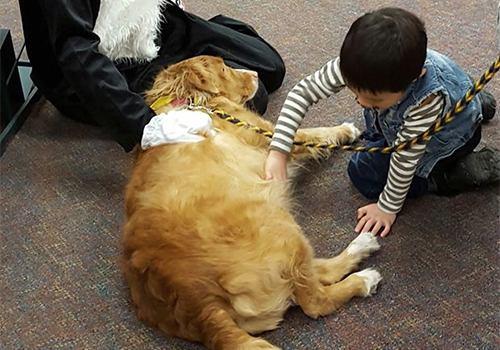 In a nod to the recent posthumously released Seuss book, Which Pet Should I Get, children were given the opportunity to interact with therapy dogs brought into the bookstore through Kent State’s Dogs on Campus program. Read Across America was founded in 1998 by the National Education Association (NEA) as a way to introduce children to books and literacy. Each year, libraries, bookstores and schools across the country celebrate Dr. Seuss’s birthday on March 2 to encourage a love of reading.